I’ve been completely redesigning my office/studio this week. The room is a normal bedroom size, about 12′ x 12′, and it serves two important purposes: I write in this room, and I create art here. The writing requires lots & lots of reference books within easy reach. I write on a variety of topics — mostly related to art, travel, history and/or paranormal themes — and I’m well-known for my exhaustive research using obscure (but fascinating) references. Writers need to promote themselves and their books. So, I have stacks of PR materials, including a dozen different styles of business cards, each tailored to a particular audience. I need to access them easily when I get a call from an event or a reporter. My art is all over the place, sometimes literally. I paint with oils and acrylics. 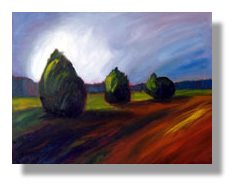 My canvases can be 36″ x 48″ or larger, and as tiny as 3″ x 3″. It’s easy to lose the little canvases and difficult to store the huge ones. They end up in boxes, behind doors, in closets, under beds, etc. I also create fabric art, especially dolls and wearable art, plus quilts. My paper arts require considerable space, including my basic collage supplies (lots & lots of magazines) and embellishments. Then there are the one-off assemblages that occur to me at odd moments, which — completed or in gestation — take up space. Placing all of my writing supplies and all of my art supplies in the center of my studio floor… well, it’s been exhilarating and enlightening. 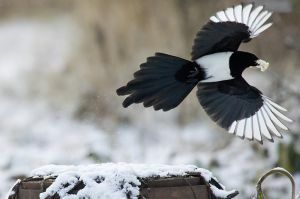 I often think of myself as a magpie, in a way. Sometimes, I see things that spark a project idea. More often, that project idea is how I explain to myself why I need to own whatever-it-is. It’s how I justify the acquisition. This is important: If I stay locked into that project idea and don’t explore other options, that collected object becomes clutter. Two years later, I have only the vaguest memory of the painting, collage, shrine or doll that I intended to make. The energy is lost, at least partly in regret. Don’t let the guilt obliterate the energy of the object, or how it resonates — no matter how quietly — with your creative impulses. That’s what I’m learning as I open boxes and rediscover half-finished projects and objects that never realized their greatness in completed art. 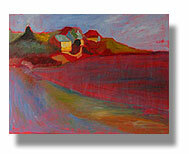 Until I hauled those paintings out of the closet last night, I had no idea those paintings were such wonderful starts. With a fresh eye, I can see what works — and what doesn’t — and the energy is surging off the canvas as I admire it. Yarn intended as doll hair now sings to me as embellishment wall hanging. Books that I purchased are falling open to illustrations and phrases that almost glow with inspiration. This is a very cool experience. Though I realize this can be an excuse to accumulate clutter, I think it’s vital to avoid the extremes of collecting or purging, compulsively. I’m also mindful that — from a bigger perspective — if you’re supposed to create a particular work of art, the supplies will probably show up, almost on their own. However, as I sit here surrounded by art supplies, books and projects, I’m astonished at how precisely my “magpie collection” is fitting into place. It’s as if I always knew that this day would happen. It’s a concept worth considering. I followed you yrs ago and then lost track of you. I recently remembered how much I learned from you and Google you. Found your website and am having so much fun reading all the posts! Next Next post: Previous subscriber?